Piedras Blancas takes its name from a white rock outcrop at the end of the point. It's a rocky point on the San Luis Obispo County coast, and its lighthouse adds just another item on your list of things do if you're traveling between Carmel and Morro Bay on California Highway One. Today, the lighthouse tower remains, but the upper levels are gone. It is on land maintained by the Bureau of Land Management, who are working to restore it. 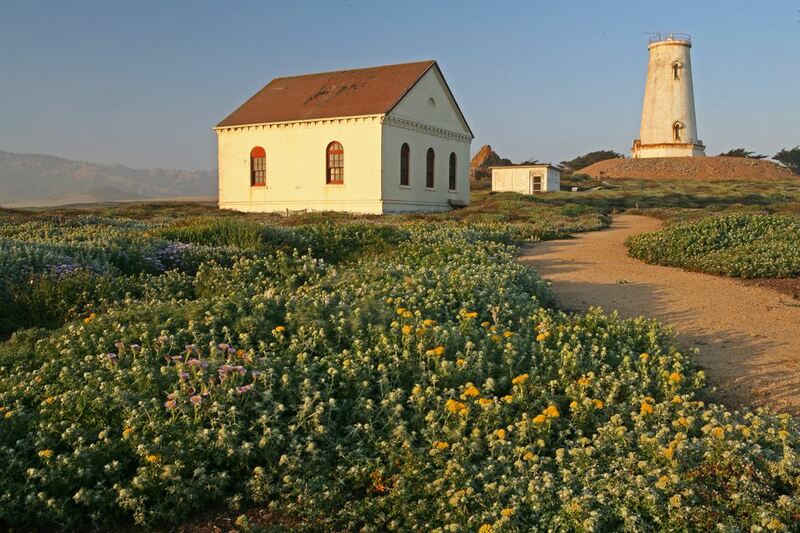 You can see the Piedras Blancas Lighthouse, but only on a guided tour. Those tours happen a few days a week. You can check the current schedule at their website. You don't need reservations. You will go inside the lighthouse building, but visitors aren't allowed in the tower. Nearby, you'll find Hearst Castle — and in winter, you can watch elephant seals from an overlook near Highway One. A few miles north, the town of Cambria is also a fun place to visit. The Fresnel lens from the Piedras Blancas Lighthouse is currently on view on Main Street in downtown Cambria, next to the Lawn Bowling Club. Also in Cambria, you'll find the head keeper's house on Chatham Street. It was cut into quarters and moved there in the 1960s. The point of land at Piedras Blancas was chosen the early 1870's to fill a gap between lights at Point Conception and Point Sur. $70,000 was allocated for the project. Work began in 1874, but it took until 1875 to complete. The land was set aside for a light station in 1866, but by 1874, ownership reverted to Don Juan Castro, who owned Rancho Piedra Blanca, a Mexican land grant originally given to Doe Jose de Jesus Pico in 1840. Castro was unhappy about the project, but it went ahead anyway. Captain Ashley, who also supervised construction of a lighthouse at Point Arena was in charge of building the light at Piedras Blancas. The local rock proved to be impossible to blast away or drill into. Eventually, the plans were changed, and the part of the tower below the floor was built around the rock. The Piedras Blancas lighthouse tower was 100 feet tall, with a first-order Fresnel lens cut and polished in France, creating a bright light that could be seen 25 miles from shore. Its signature was a flash every 15 seconds. At first, the lightkeepers lived in the shanties used to house construction workers. Eventually, a two-story, Victorian-style house was finished in 1875. A fog signal building and another keeper's house were built in 1906. Captain Lorin Vincent Thorndyke was the first Piedras Blancas lightkeeper, serving from 1876 until he retired in 1906. Records of his successors have been lost, but we do know that the civilian-run U.S. Lighthouse Service ran Piedras Blancas until 1939 when the U.S. Coast Guard took over. In 1916, the signature flash changed to a double flash every 15 seconds. In 1948, an earthquake damaged the lighthouse, and its three upper levels became so unsafe that they were removed, making it about 70 feet tall. An electric beacon replaced the old kerosene lamp in 1949. The station was automated and unmanned in 1975 and closed in 1991. The Coast Guard turned the Piedras Blancas Light Station over to The Bureau of Land Management in 2001, and it re-opened for tours in 2005. Today, the lighthouse is again a navigation aid, flashing a signal every 10 seconds. The tours last about 2 hours and require about a half mile of walking. They may be canceled in bad weather. A tour fee is charged. Pets are not allowed on the tour. You do not need reservations. You may also want to find more California lighthouses to tour on our California Lighthouse Map. Piedras Blancas Lighthouse is on California Highway 1 at 15950 Cabrillo Highway, just north of San Simeon. You can see it as you drive by on Highway 1. Tours meet at the former Piedras Blancas Motel about 1.5 miles north of the lighthouse.